Cigars can cause cancer too. Some people believe that cigar smoking is not as harmful as smoking cigarettes - but they are wrong. Cigars contain the same toxic and cancer causing compounds as cigarettes. Just because they look like they are made from tobacco leaves as opposed to cigarettes which have small amounts of tobacco in them does not mean they are not harmful. Many people who smoke cigars do not inhale deeply taking the smoke into their mouth rather down deep into the lungs. All this means is that they may avoid getting lung cancer. However, there are many other types of cancer you can get: lip cancer, tongue, mouth, throat and larynx cancer are all possibilities. 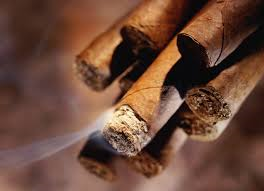 A large cigar can have up to 15 times the amount of tobacco as a cigarette. A premium large one can have the same amount of tobacco as a whole packet of cigarettes so if it is smoked in a few hours it would be the same as smoking a whole pack of cigarettes in one evening! People who have quit smoking cigarettes and then take up cigar smoking tend to inhale the smoke. These people are more at risk of getting lung cancer than people who never smoked cigarettes. Cigarettes contain less than 1 gram of tobacco whereas cigars can vary in size. If a person smokes 5 average or medium size cigars per day and moderately inhales the smoke their risk of lung cancer would be the same as for someone who smokes 20 cigarettes per day. When a cigar burns and the smoke from the tip is analysed it is found to contain more ammonia, more cadmium (carcinogeous metal) and almost 100 times more of the carcinogeous nitrosamines. It is important to remember that one person dies every hour in the US from some form of oral cancer. On my list of chemicals contained in cigarettes these are the ones that begin with "diethyl" or "dimethyl" on the page for chemicals beginning with D.
The average cigarette contains around 8 milligrams of nicotine but a large cigar can contain 50 times this amount and the nicotine is absorbed through the delicate lining of the mouth. This makes them addictive and therefore just as difficult to quit. Some people make out that the smoking of cigars is a hobby - they collect different brands and sizes and store them in a humidor for safe keeping and for display. It would be a safe hobby if they never smoked them but that is not usually the case - it is a lethal hobby to have. As with any kind of smoking it is important to remember that it is the smoke that is carcinogeous and the nicotine that is addictive. Nicotine still has its dangers in that it is a vasoconstrictor which causes health problems separate to cancer. Chemicals beginning with the letter D.
Return from Cigars to Home Page.